Hans Frank & The Auslanders - Glambilly! One look at his hair, which resembles the end result of a Saturday morning cartoon electrocution, tells you that if Hans Frank is part of the Texas Country Music scene, then he's definitely on the fringe. However, Frank's time as the cleancut leader of critically acclaimed country band 10 City Run firmly establishes his credibility in the genre. Well, 10 City Run was officially killed off late last year, and Frank subsequently re-emerged as the leader of The Auslanders, who comprise the ageless Bobby Natanson on drums and the legendary Pete Mitchell on guitar. I hadn't seen The Auslanders' live show, and hadn't heard the live album they released, so I wasn't really sure what to expect from the band's first studio release. But, having heard the solo demo Hans had made last year, I have to admit, I was pretty sure I'd like it. I hear that train a-comin'. It's comin' 'round the bend. I ain't seen the sunshine, since I don't know when. I think, "Hey, I know that song," and, sure enough, the tune is called "Folsom Prison Rumba" (that's right, "rumba"), and it is easily the coolest cover of Johnny Cash's song I've ever heard. It embodies what I consider to be the primary reason to do a cover tune, and that is to put a new spin on it, make it your own. Besides "Folsom" and a darker take on the Bob Wills classic "Stay All Night" — a similar version of this song appeared on the 10 City Run album Somethin' Else — Hans includes eight originals on Glambilly! that give us an idea of what scary things may be going on inside his wildly coiffured head. In order of appearance, "Last Night" is the first-person account of a wacko who killed a stray dog just for fun and then has his woman leave him. "Regular" is a song about sobriety. The use of cowbell in that song and elsewhere on the record would make fictional record producer Bruce Dickinson very happy. "I Love the Women" has Hans admitting, as originally written by Jimmie Rodgers, that "these women make a fool out of me." That may tell us where he's coming from when he shouts "Get The Hell Outta My House" over and over in the next song, which, as you may learn from an Auslanders live show, is relatable to anyone "who has ever had a Cops moment." The tune features some frenetic drumming and a vocal performance by Frank to match it. "Laura's Store" is a cool jam song that leads us into the best three-song segment of the album: "Easter '94," "Bleed," and "Tar Tool." Thematically, none of these songs is a pick-me-up, by any means, but "Easter '94," with its me-first attitude, and "Tar Tool," a country song about a zombie, are good fun to sing along with. A good friend is so hard to find. The people you know ain't worth a damn. I got the ball. I know I'm right. I'm stuck here on the ground. That don't mean it don't hurt, when you all pile on. Don't you ever, ever let 'em see you bleed. That's a Frank assessement of a man down on his luck, but who has not given up the fight dammit! 10 City Run's Somethin' Else was a really good record, but if you look at the credits, you'll see that the darkets ones are those penned by Hans Frank. Now free of the constraints imposed by record label executives, Frank is able to explore his darker side more fully, and he does so with Glambilly!. But, don't worry, Hans hasn't forsaken the lighter side of his old band — the songs are still primarily upbeat and even danceable. He just takes 10 City Run one step beyond. 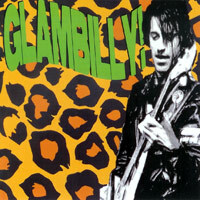 Yeah, that's right: on a scale of 1 to 10 (City Run), Glambilly! goes to 11.